It's still around, I wadded a fender up. Gathered a perfect bed, and have been using it to drag the hunting boat around. And look cute next to the ford. I am loving the picture of the Toyota next to the Ford. I never used to like those Fords but they are growing on me. I have a 476ci gm (.100 over 454) that makes 428 hp. All balanced, ported and polished, stainless intake valves inconel exhaust valves, custom ground cam list goes on a while... Had it in my boat, pulled it to put a 618hp 509 in its place. But if and when the ford gets a heart transplant it will no longer have spark plugs. I was just joking with that 454, the only other motors I'd put in an old Ford besides a diesel is a Ford 460 or a Cadillac 500. It's nice to see those old Ford's though, I drive an 86 F250 my self. I had an opportunity to get a stock 460 a while back but passed on it because the little 360 runs so well. If it ever does act up on me a 5.9 will be going in it. Pulled the starter and alternator from the 3rz Sunday morning. Dropped off for rebuild today. Starter had gotten iffy and alternator bearings sounded horrible. Also disassembled the winch in hopes of repairing the motor. Not sure if I can or not but we will see. They may have replacement motors you can buy for it. I had to replace the one on my mile marker because the magnetic broke and would physically bind the motor. My 1st hobo winch did that. I got it in 2005, used and abused til 2014 when it died due to magnets falling. This one is Gordon's old one that went submarine a few too many times I guess because the internals of the motor are shot. I called mile marker yesterday. They say they will have someone contact me with the measurements I asked for. Fingers crossed they are the same as mine. If so it will immediately be disassembled and sealed before installing. Starter and alternator came back today. Have a few boat motors to finish working on so not sure when I can get them back on the truck. Both were original from 96 kind of cool that they are going back on it. Alt and starter back on and doing their jobs. I really hate that I used the poly bushings with the front range cross member. It is not a smooth idle like a taco has. If it had a normal rubber trans mount it would be much better. It's been a while since you have updated. Any further progress or even pictures? I still dig this thing. Not really. I use it fairly often to haul the boats. 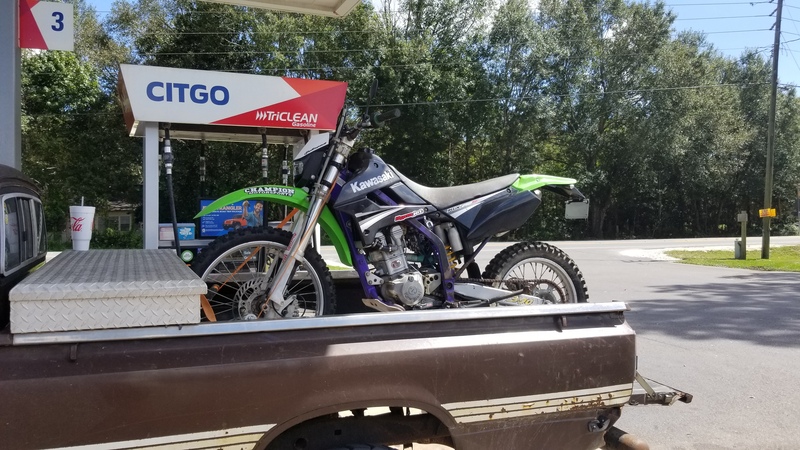 I used it last weekend when I got a dirt bike. More in the line of progress. Sunday a friend and I tore down the 4.7 case above and installed a 23 spline input as well as figured out why it would attempt to go into 4wd without pressure on the shifter. The 2wd/4wd shift hub was installed backwards. In the heat of the moment decided it was time to dig out an 80 model tcase to make the crawl box. Got that handled so now it sits in his shop until I take the truck over to poke the cases in and do chevy rear springs. Just got off the phone with James at MC. Very helpful in getting some shackle bushings and hardware kit for the mc07 doubler. Phone was answered in seconds. It appears the past issues of long holding has been resolved. Ups let me down today. Didnt arrive with the tcase studs. But I did get the truck to Frank's house and on the lift. We removed the old case and cross member. Test fit the doubler. Apparently I have read wrong in the past. I was under the impression that running the 21 spline fully splined input from a 79-81 4 speed was the way to go. It would not fully mate up. In the 2nd image you can see where the splines get larger compared to the void in a newer case. They would not fit into the w56 tail shaft. So I used a metabo with a flapper wheel and turned them down slightly. It then fit well so it got put in. Tomorrow hopefully the tcase studs arrive so I can get the case in, cross member mounted. And the triple sticks mounted. Doubler is now in. Built some cross member mounts. Let them cool down last night. Today I will cut them off flush with the bottom of the frame. Leaving the old ones incase I ever go back to single case in this truck. Today I sand blasted the shifters and painted them. This evening the plan is to get some f150 springs from the junk yard. Put the cross member in, rear triple drilled flange on. Start on spring swaps so the driveline can be measured and built. Got conned into eating tonight with some friends. But I did manage to get some rear springs from a 2000 4 door f150 for $36. Put the cross member in. Got the sticks mounted and adjusted. Have to do some surgery to the floor pan to get it all covered. Any particular reason that you're running the f150 springs vs the 63" chevy springs? Ford springs because I hated the 63s on the 4runner. Got hung up on everything. Moved the front hanger about 7". The rear hanger I cut off the 80 frame. Moved its bracket 1" rear of the existing rear bracket. Welded a 2x3 box tubing cross member in. Added 2 leaves from some other stuff I had into the f150 4 leaf packs. The rear shackle is 8" center. I'm going to make some 6" and it should set dead level. The front with the 5" Tg front springs had the axle dead center of wheel well. Ofcourse everyone knows I'm a ruf fan. I took the old ruf main leaf and used the tg pack all except main leaf. Had to cur the wraps off the 2nd leaf to make it fit because the tg leaves were actually 2" longer. With that done and mounted I also had previously drilled the spring perches. Got the axle about 5-6" ahead of center. Plenty of cab clearance at full lock. I didn't realize that you got hung up on them all the time. I loved em on my rig when it was leaf sprung. They worked great! Every time I had to back up in mud or sand they stuck in the ground. What size tires were you running? I bet that is the difference. They do hang back past the axles a decent bit. Hmm, that's the same tires size i was running. What is the distance from the center pin to the rear of the spring on the ford springs?